PAUL JAY, SENIOR EDITOR, TRNN: Welcome to The Real News Network. I’m Paul Jay in Baltimore. This is Reality Asserts Itself. We’re continuing our series of interviews with the final segment with Heiner Flassbeck, who now joins us again in the studio. DR. HEINER FLASSBECK, FMR. DIRECTOR, UNCTAD DIVISION ON GLOBALIZATION AND DEVELOPMENT STRATEGIES: Thanks for inviting me. JAY: So, one more time, Heiner worked at UNCTAD, and from 2003 to 2012 he was the director of the Division on Globalization and Development Strategies. He now runs Flassbeck-Economics, which is a consultancy. And you can find him at Flassbeck-Economics.de. So we’ve been all–in all the segments so far of our interview we keep coming to if a reasonable, rational capitalist and that person then would do. And we’ve kind of agreed there may be a few, but even they, even billionaires who seem to have some sense of the need for regulation, the need for higher wages, the need for not having so much wealth concentrated in so few hands and so on and so on, even they’re marginalized. And in terms of who controls the politics of the United States, Europe, Canada–and not all of the world; I think in Latin America there are some exceptions; but more or less most of the developed world, certainly, you do not find such capitalists. Is that not where capitalism is? I mean, it’s not like just a bunch of guys happened to think one way. It’s that in terms of the objective process, ownership has become so concentrated, and as a result of that concentrated ownership, you have such concentrated political power and, in the United States now, this completely unfettered ability for individuals to donate–and it was already overboard; now you can’t even describe what’s going to happen with the politics now–is if you look at–and we’ve only been talking about speculation. We’ve only been talking about the financial and economic crisis. Now add to that climate change. And so far–and there’s no reason in any short-term way to see any change–capitalism seems absolutely incapable of dealing [with] any of the serious issues with climate change. It can’t deal with the issue of speculation and wages and such. I mean, is capitalism as we know it, you know, done, in the sense not that it’s going to have some great collapse and go away, but is it done in terms of it can no longer generate growth, it can no longer face up to and solve the problems facing it? And do we not have to move to something new? Or are we going to see the 1930s and are we going to see the solution capitalism is going to come up with is fascism? And in the United States there may have been that moment where there was an alternative route, through FDR and the New Deal, but in the United States, if you look at the politics now, you can’t even see that being possible. It’s far more likely to have some form of far-right solution here as well. 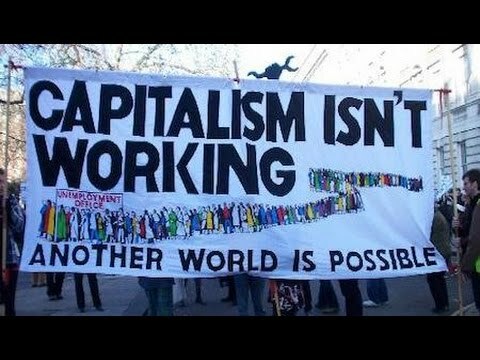 So do we not have to be thinking beyond any kind of version, at least, of capitalism we know? FLASSBECK: Well, that is a very difficult question, whether there is something else. The alternative–unfortunately, we do not know a good alternative. We know the alternative in terms of a very regulated capitalism, what we had in the Bretton Woods area, what we have in some countries, like China, where we have a strong, dominant state that allows market, but not unlimited, unfettered market, but to a certain extent. But even there, there is a strong tendency to open it more, to liberalize it more in a way that–. JAY: And they’re totally enmeshed in the global system anyway. FLASSBECK: Yeah, they’re going to that. But in the global system we have no solution. This is the crucial thing for me. We have no global solution. And all the attempts to do that, to find a global solution, in the G20 or elsewhere, failed dramatically. So in Europe we failed with coordination of policies. So we will go back into what I fear, kind of right-wing governments that will de-Europe-ize the whole continent. And in the United States, well, the question is where to go. Let me say the crucial question is, at the end, again, spending, demand. Where does demand come from? The only way to have a capitalist economy running is that you have functioning companies that are investing, companies that are, so to say, taking the savings of the workers that are able to save and to put something aside and then invest it. This is the way capitalism can work. Today we’re living in a world where the capitalists all over the place, in the United States, in Great Britain, and in Europe, are also net savers. They have so much money that they do not invest enough to spend that money. JAY: So they just gamble with each other in derivatives. FLASSBECK: Yeah, they’re gambling with it, yeah. But this is the end of capitalism in the way we know it, because this cannot go on. So then–because then, at the global scale, only the government can be the one, the big spender, so to say, if their households are not able to spend because they do not have income. JAY: Well, then here’s what I don’t get, frankly, about your logic, okay? JAY: If only the government–you’ve used that phrase [a few] times. Then why isn’t the issue public ownership of some form or another? ‘Cause it’s through that concentrated private ownership you get control of the politics. FLASSBECK: Yeah, but public ownership is politically blocked. And even public spending is blocked politically. So the capitalism are blocking themselves. They’re blocking themselves by blocking everything. They’re not investing themselves. They’re blocking the government from being the big spender and taking on government debt. They’re not giving income to the workers. So the whole system comes to an end. It hits the wall at a certain point. So what I expect is a bigger crisis than we have seen. And then again comes the question: do we find the politicians who are able to learn the lesson from this bigger crisis, maybe the big depression or however you may call it, to find a way out into a new system? Which, in my opinion, should not be a totally planned system or a socialist system or something like that, but again a mixed system, where we have a strong government that is regulating the most crucial things. The most crucial things are the financial markets and the labor market. This has to be regulated by the government. Otherwise it cannot work. JAY: But it’s also a political question, like, who has the power and the issue of democratization, isn’t it? As long as you’re going to have these decisions made by a very small stratum of the population and they make it because they own stuff, you’re not going to have this rationality you’re looking for, unless you can democratize–. FLASSBECK: But that is why I think they will hit the wall again. And we’ll hit it harder than last time. JAY: So you [incompr.] like, the emergence of some politician. Just there has to be some democratization and some mass mobilization. FLASSBECK: After the crisis. After the crisis. Yeah, after the next crisis. Not without nothing. In a stagnative mood, nothing is going to happen. But the next crisis will come. And when the next crisis comes–. JAY: So we’d better get ready. JAY: Well, ’cause, if we don’t get ready for something, you know, as a more progressive, enlightened alternative, the alternative is going to be fascism. FLASSBECK: Yeah, that is right. That always in history was the alternative. Either you get then a dictatorship from one side or the other or you get a renovation of democracy and the market economy. But this is the crucial thing. JAY: What do make of what’s happening in Latin America? There’s nothing perfect about what’s happening, and there’s lots of weaknesses and flaws. It’s raw. But do you think there’s something happening there that points to a different way to do things? FLASSBECK: Well, a little bit. Unfortunately–and I’ll say that many of the attempts were not really thought through. If you look at Venezuela, they have done very reasonable things but also very crazy things. They never tried to have a clear macroeconomic policy. They never tried to have a reasonable and rational currency policy on monetary policy and things like that. And they should have joined forces with the others. But as I said, the cooperation–. JAY: What do you think of what’s happening in Ecuador? Ecuador seems to be–. FLASSBECK: Ecuador is going to be better, but Ecuador is a dollarized country. Imagine: they are under a terrible constraint, the worst constraint you can be; namely, you have to bring the dollars in suitcases into the country to have bills to pay your bills with. It’s terrible. And under these constraints, it was a great job that Correa did. President Correa did a great job. But it’s not a solution. It’s not a solution to nothing. But he was the one who tried to go for more more monetary cooperation, because he wanted to get rid of this dollarization, but his partners–he didn’t find a partner for that. JAY: So ordinary Americans are watching this interview. I would think they’re getting freaked out if they weren’t already. What do you suggest they do? FLASSBECK: Well, they should join–try to engage politically. I think we need alternatives. It cannot go on with the two parties in the United States without big friction that are going to come. It cannot go on with the conservative and social democratic parties in Europe that are doing the same things whenever they come to power, as we see in France now and elsewhere. So doesn’t work like that. We need a rather rational, reasonable alternative that is giving a chance to global coordination, that is open to intervention of the state in the markets where the markets do not work, and things like that. So this is urgent. So I can only urge everybody to think about his own situation and to join forces with other people to create parties, found NGOs, or whatever you do to become active politically and to say [a word (?)] on these things. JAY: Alright. Thanks very much. JAY: And thank you for joining us on The Real News Network. If you want to see more of Heiner’s work, you can find it at Flassbeck-Economics.de. And thank you for joining us on Reality Asserts Itself on The Real News Network.